counting and writing numbers from 1 to 12, through animated photos. 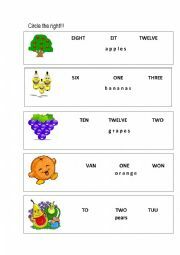 Revision of fruits and everyday vocabulary! The famous fairy tale in English with images and dialogs... It helps practising grammar(plural, verbs, everyday expessions, etc), vocabulary, understanding a text and reading.. I hope you find it useful!! This is a simple but informative presentation about Vikings, about their life, their expansion, till their end! I hope you find it useful!